A 55-year-old worker has been seriously injured in a fall. He is currently receiving total disability at a rate of $600.00 per week. It is expected that he will reach MMI in 12 months. At that time it is unclear whether he will be able to return to work at a permanent light duty position which pays less and entitles him to $400.00 per week or be disabled for the rest of his life. In this jurisdiction he is entitled to 512 weeks of wage loss benefits if he has a work capacity. If he has no work capacity he is entitled to lifetime benefits and a cost of living adjustment. Medical benefits are not closed out in a settlement. The claimant attorney estimates that there is a 40% chance that he will be entitled to lifetime benefits. This example will be evaluated from the claimant attorney's perspective. We begin by using the life table to get the worker's life expectancy in weeks. Most insurance companies invest in corporate bonds with maturities that match the timing of their expected payouts. Corporate bond rates can be found here. I am going to use a rate of 4% which is in the range for 20 year bonds. The COLA Rate is jurisdictionally dependent. Some jurisdictions base this on consumer inflation rates and other jurisdictions base this on the average wages for workers. One way to come up with a reasonable rate is to take an average of COLA over the last few years. I am going to use a 3% COLA rate. 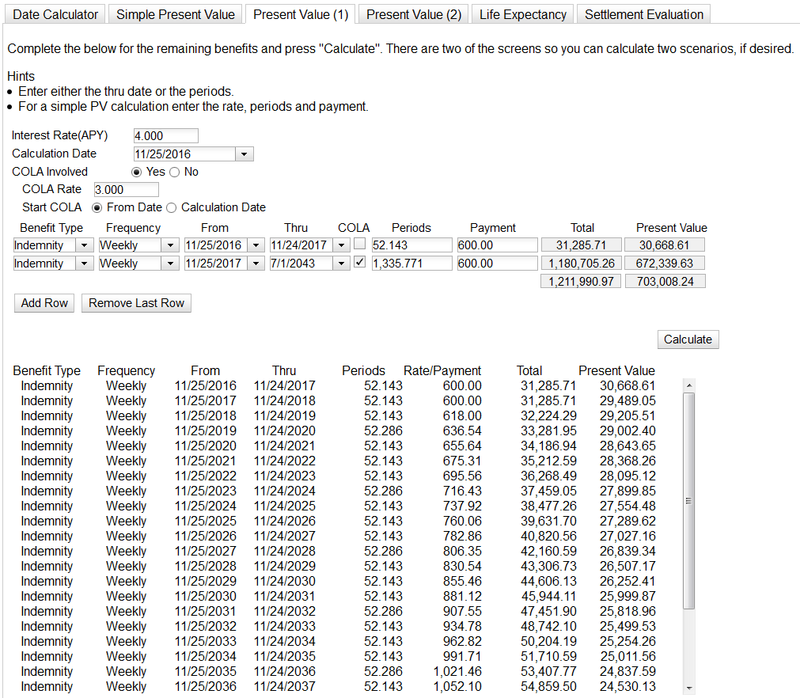 Below is the completed Present Value(1) screen. The Present Value(2) screen is completed for the wage loss benefits. I am going to use a Discount Rate of 3%. This is a shorter term exposure so the Discount Rate should be less than that used for the lifetime benefits. I arrived at the 3% by looking at the range for 10 year corporate bonds. 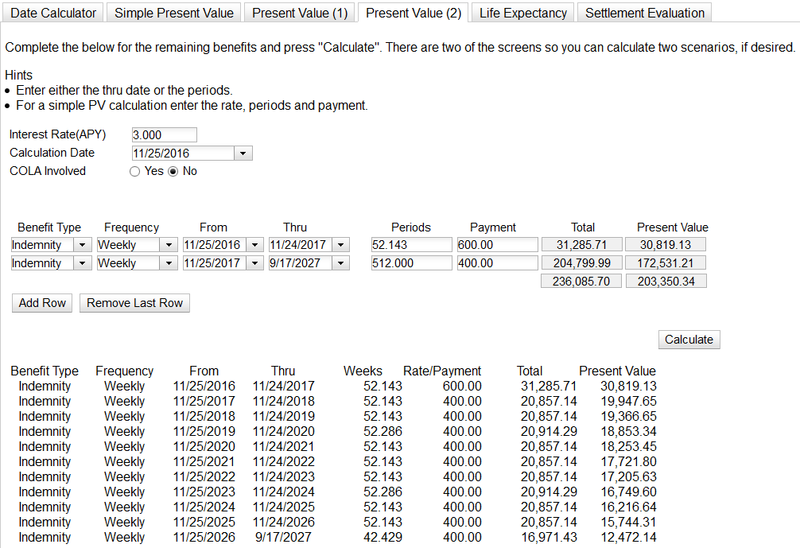 Below is the completed Present Value(2) screen. Below is the completed Settlement Evaluation screen. 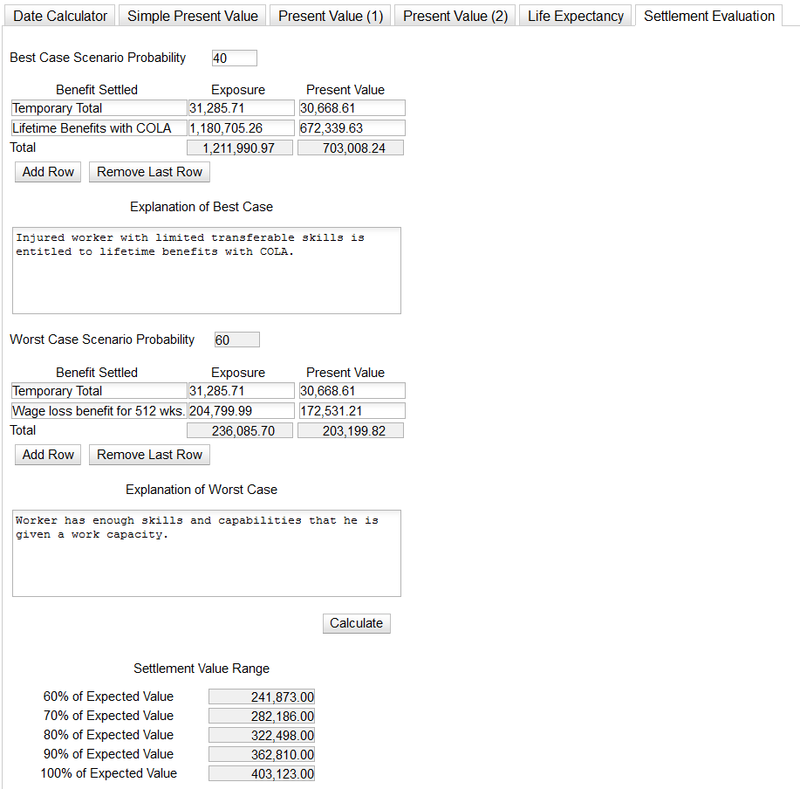 Based on the results the case has a decision tree settlement value between 242K and 403K. My own experience is that cases typically settle in the 70 to 80% range of the expected value. Although we believe the calculations provided to be correct, we do not assume liability for any incorrect calculations. If you suspect that any calculation contains an error please e-mail us and we will research the calculation.